A mix of existing materials and ColorCote roofing and cladding created a cohesive aesthetic and provided superior protection in a harsh coastal environment. 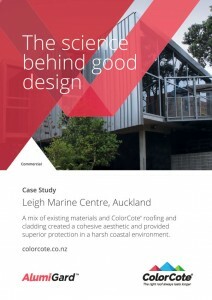 Since the early 1960s, University of Auckland’s Marine Laboratory at Leigh has played a vital role in marine science research and education. As the centre grew to accommodate more staff and students, buildings and extensions were added on the clifftop site, but with no overall plan. While the infrastructure worked, aesthetically it did not, and it might have stayed that way if not for a generous donation from the Edith Winstone Blackwell Foundation Trust, which kick-started a $10 million redevelopment of the site. The redevelopment was master planned by Cheshire Architects in conjunction with the University’s own Property Services Department and involved the reuse and refurbishment of existing materials, as well as the construction of three new buildings. Coastal sites such as Leigh provide challenges because they are visually sensitive, yet harsh environments. A lot of work went into the detailing of the roofing and cladding to add interest to the building. A mix of timber and metal gives the buildings a modern presence while still allowing it to blend in and honour its coastal surroundings. Because of its robust nature, ColorCote AlumiGard was chosen for the roofing and cladding on the interpretive centre and timber-clad bunkrooms, and was also used to partially clad the science centre in addition to timber cladding and exposed blockwork. AlumiGard is designed to withstand very severe marine environments and has an extremely durable paint system that resists UV damage and provides excellent gloss and colour retention. The new design of the centre will allow marine samples to be brought into the building straight from the research boats and the interpretive centre, which has video and touch screens, display boards and specimens on show, allows the public a window into the kind research performed at the marine centre.